The construction of a new, modern Aquatic Centre allows UBC the opportunity to expand and update its current aquatic program. Alongside the need to ensure a new facility can compete with similar facilities in other Post-Secondary institutions, a new Centre will be able to adequately service the growing residential neighbourhoods on campus. A balance between a competition facility and a neighbourhood leisure facility is a mandate of the final project. Construction is well underway and is expected to be completed late fall 2016. The project will cost approximately $39 million dollars in capital funding. More information on this project is available here. The new UBC Aquatic Centre construction project reaches major milestone with completion of the roof; one year countdown is on. January marks a significant milestone for the new UBC Aquatic Centre project as the new facility’s roof is now complete. This benchmark is a key date as the project continues to be on track for completion for late fall 2016. The rich culture and history of aquatic sport and recreation is about to be greatly enriched with the construction of a new UBC Aquatic Centre given its amenities. 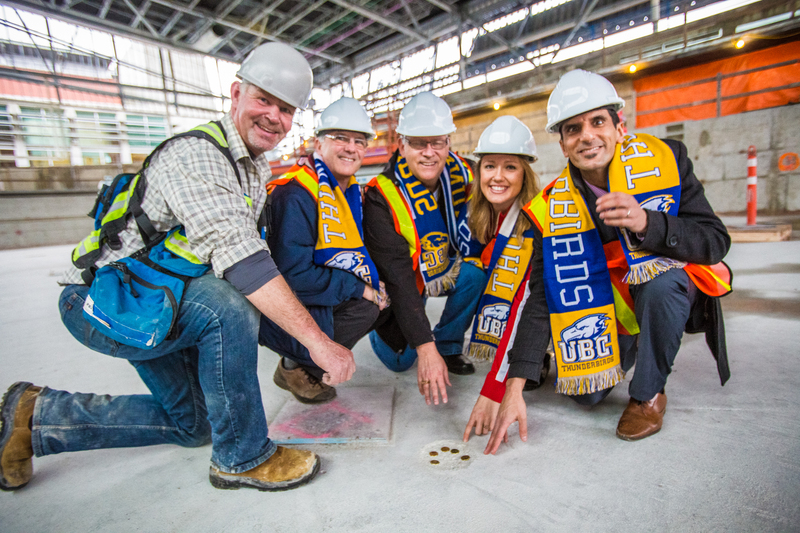 UBC staff and athletes took time out this week to acknowledge the work of the construction crew, some of whom have been working on-site since the start of the $39-million project in August 2014. “This new aquatic facility will not only be the home of the UBC Thunderbirds varsity swimming programs, as well as be a great amenity for students, but will also better service the needs of residents and the growing UBC community,” shared Kavie Toor, Director Facilities & Business Development with UBC Athletics & Recreation. The new UBC Aquatic Centre will feature a 10-lane 50m ‘FINA certified’ competition pool, an 8-lane 25m pool with accessible ramp and diving boards, a leisure pool including an accessible ramp, lazy river, along with other key water features. Additional amenities in the new UBC Aquatic Centre are 30-person hot tub, a food and beverage kiosk, and viewing areas at both deck and mezzanine levels. Additionally, the facility is also being outfitted for sauna and steam room capabilities to be completed at a future date. UBC has long been associated with aquatic excellence. As home to successful varsity swimming programs and many of Canada’s national swim team through Swimming Canada’s High Performance Centre, UBC holds rights to 34 Canadian Interuniversity Sport titles and is credited as being home of 40 Olympian alumni swimmers. In an effort to ensure the new UBC Aquatic Centre provides aquatic opportunities for the entire community, UBC Aquatic Centre staff are engaging with the aquatic community, pool users and the public as part of the process of developing programming and services levels for the new facility. The next opportunity to actively engage in the process and share ideas is at a UBC Athletics & Recreation Open House scheduled for Friday February 19th (4-6pm). The Aquatic Centre has received approval and the civil works portion of the project will fully commence in early August and site prep work has already commenced. This new facility will provide numerous benefits to the University by providing state of the art swimming facilities for the varsity swim teams and the community. The total budget for this project is $39,900,000 with funding to be raised through land development cost of sales as a community amenity expense (approx. 69%), donor fundraising (29%) and Infrastructure Impact Charges (2%). Construction is expected to take approximately two years and be complete by December of 2016. As a result of the construction project, the War Memorial Gymnasium parking lot will no longer be available. There will still be a servicing / loading area and short term parking / pick / up drop off will be at the GSAB lot. A live webcam feed of the construction site can be found here. UBC’s north end of campus has been under redevelopment for some time. In the last year construction has finished on the new trolley bus loop and the new SUB. Once completed, the new Aquatic Centre will aid in making one of the busiest sectors of campus a revitalized and modern hub of activity. Once the new Aquatic Centre has opened, the current Aquatic Centre will be demolished and make way for the new site of McInnes Field. Take a look at the photos below and check out the Acton Ostry Architects site for more info and pictures. Photos from Acton Ostry Architects Inc.